Air plants grow "in" air, not requiring any soil or other growth medium, but they do not grow "on" air. Your plant needs three things to prosper: Light, water, and some air movement. (A little bit of soluble bromeliad fertilizer containing no copper will be beneficial, but it is not necessary.) You need also to evaluate your plant's care regimen from time to time, and remember that it has a specific life cycle. 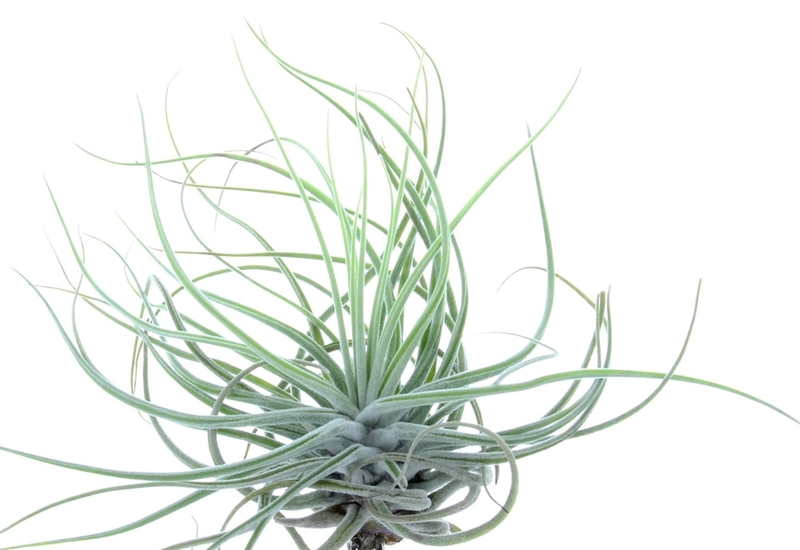 In nature — forests, mountains and deserts, mostly in South and Central America — tillandsias are epiphytic: they grow on other plants but do not harm them (unlike parasites), and take up their water and nutrients from the air. Taking care of your tillandsias basically means recreating their natural habitat, as far as is reasonably possible — the goal is an environment that has a higher relative humidity than our typical homes (and even our normal outdoors), but also has good airflow. 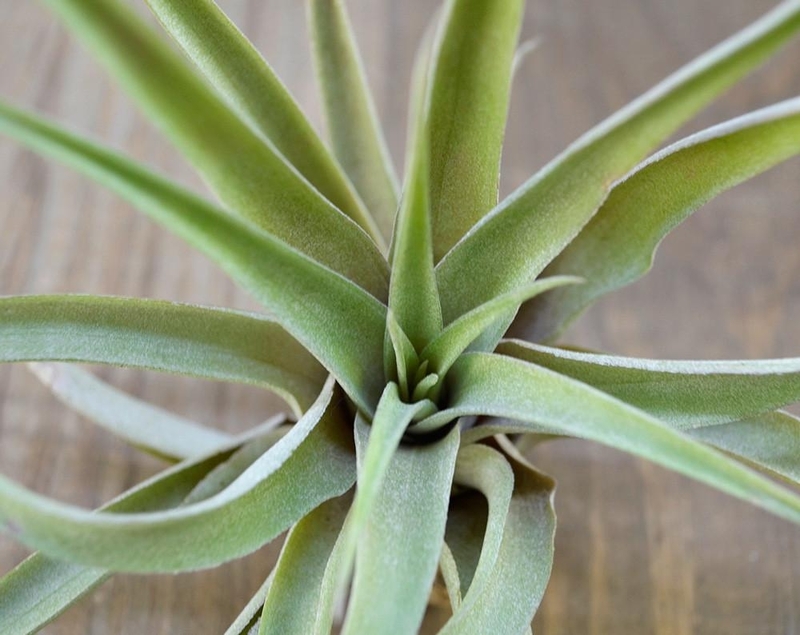 In or around your home, tillandsias can be grown in a variety of ways: on tree branches, mounted on whatever you like, in terrariums, all by itself on a shelf or window sill...the possibilities are endless, as long as they get light, water, and air. Like all plants, tillandsias need light, but only a few species will be happy in direct sun — they prefer bright but indirect light. · The higher the humidity, the more light the plant can tolerate; and vice versa. So, if you put the plant in lots of light, but low humidity, you should water it more than in a more humid space. Bathrooms are normally great places for tillandsias: higher humidity, lots of light. · Greener plants can do with less light than those with grey to almost white leaves. ·If your plant looks happy, it normally is! Technically north and east facing windows are best, but as long as the plant gets enough light any position will do. Be careful of western windows: light comes late in the day, and might be a bit too hot for your plant. You can put a tillandsia where it gets no natural light, but then you have to supply the correct light. 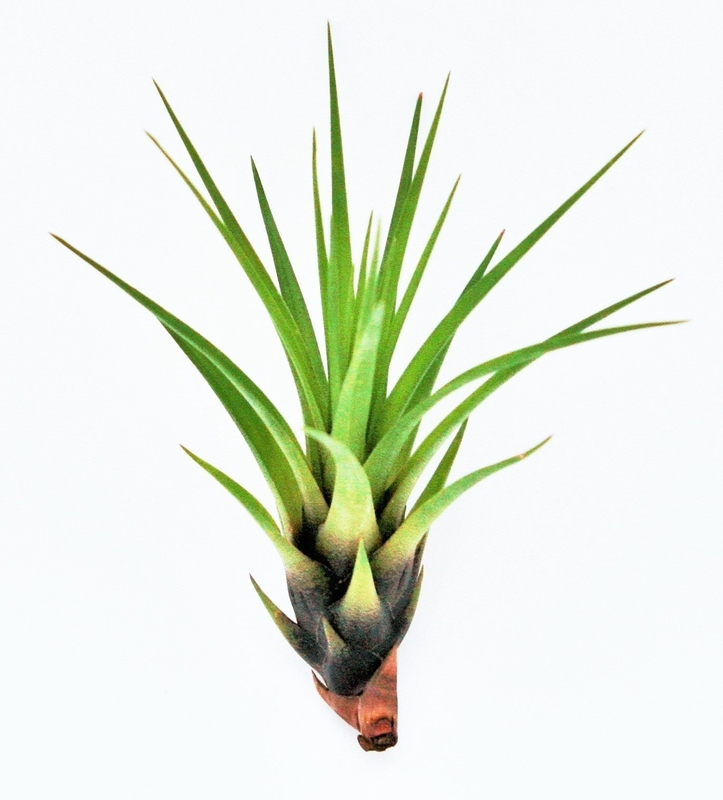 Full spectrum fluorescent light is essential — regular light bulbs don't supply the specific light needed by tillandsias (and most other plants) to photosynthesize properly. If you're using fluorescent light, the plants will need at least 12 hours of light per day. You might also invest in a grow lamp, available from some nurseries and lighting shops. In a nutshell, watering tillandsias involves getting them thoroughly wet (to runoff) all over, under the leaves as well, then letting them dry as soon as possible (within 4 hours), then allowing them to be dry for a day or more before the next watering. This can be done by flooding, misting, dunking and soaking. · Flooding/misting: at least twice a week, flood or mist your plant(s) thoroughly — the entire surface of the plant should be wet. Use a watering can or hosepipe for flooding where appropriate, and a spray bottle from your local hardware (or kitchen) store for misting. · Dunking is exactly what the word says: You dunk the plant in water, shake off excess water, let it dry, put back on its mount. In our experience, dunking plants in normal water is the best technique for regular watering, where possible. You can also dunk your plant in a fish pond once a month to fertilise it naturally. Your plant should be totally dry by nightfall, so it is best to do the watering in the morning. Evening watering disrupts the plant's overnight respiration, and extends drying time. Generally speaking, greener plants need more water, silvery-white plants prefer less water. An under-watered plant can usually be saved by a few sessions of soaking,but it's virtually impossible to save an over-watered plant. Once the base of the plant turns brown or black, and leaves are falling out or off from the center, it's time for a funeral. 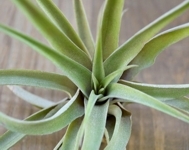 You will have to experiment a little bit, but remember that tillandsias can rather have too little than too much water. 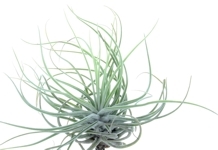 A general rule for watering tillandsias: the thinner-leafed varieties grow in rainy areas and need more water, whereas the thick-leafed varieties grow in areas more subject to drought and need less water. Much depends on how your plant is mounted. Plants mounted on small pieces of wood, or other mounts, can still be soaked and sprayed as described above — just dunk the plant on its mount into the water. Shake off excess water, and remember to ensure it will be dry by night-time. Plants on bigger mounts, will need to be misted more frequently to ensure they get adequate water. At Treebeard & Co we mist such plants every two days. Very few of our plants need more that, but when necessary we will mist a bit more. 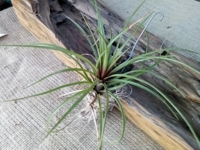 The easiest way to water tillandsias growing in or on trees, is with a hosepipe or normal garden irrigation spraying. You may have to water them more or less frequently than plants on mounts or in containers; as long as the plant looks healthy and happy, everything's OK. If the plants seem to dry out, water more regularly. Remember that plants in trees can also die from too much water, so reduce watering in rainy or humid weather. Air plant in glass will create their own micro-climate in the container: Glass vessels will retain moisture and heat for longer, so the atmosphere will be more hot and humid than outside the container. And remember that glass intensifies the sun's rays, so don't put glass containers too close to the window. If the plant(s) can be removed from the container, follow the normal watering regimen; take it out, mist/soak it, and let it dry before replacing it in the container. If the plant can't be removed from the container, you will have to rely on only misting to supply adequate moisture. Try to mist around the plant, rather than onto the plant. The goal is to create a humid environment, not to over-water the plant. You definitely do not want standing water in the bottom of your container — if this should happen, tip it out if possible or try to absorb the water with something, or at least don't mist again until the standing water is gone. Two rules of thumb apply here: · Small container -> less air circulation -> longer drying time -> less frequent misting. · Large container -> more air circulation -> shorter drying time -> more frequent misting. Start with a weekly misting, and adjust as necessary. With a little bit of careful observation you will quickly establish the correct pattern for each plant. Bear in mind that requirements will change with the seasons. For optimum growth your tillandsias need some air movement. 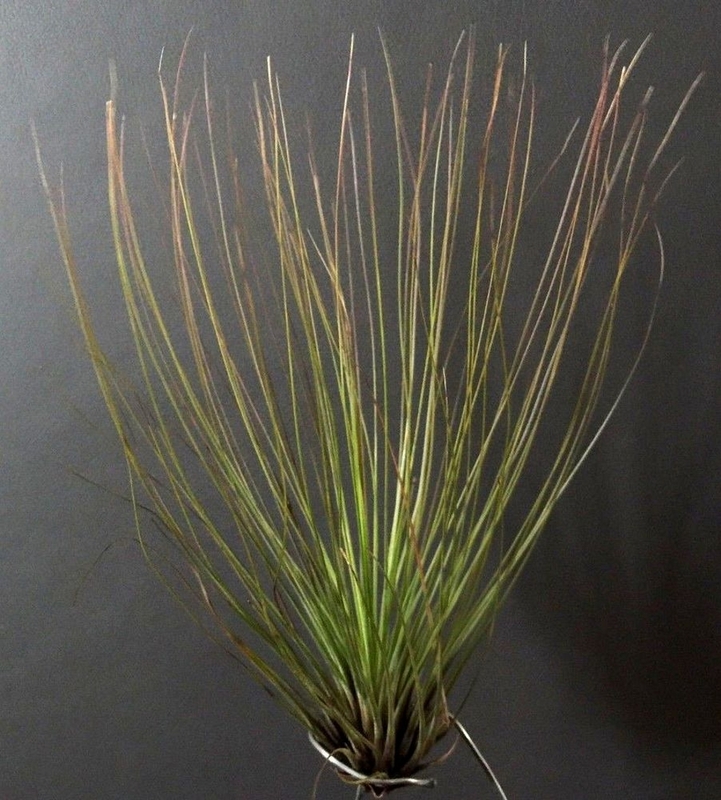 It need not be much of a wind (which will blow away your argenteas, fuchsii and filifolia if they are not tied down!) — it can be quite gentle, but as long as there is some air movement your plant will be happy. Moving air will bring in fresh air and moisture, remove the by-products of photosynthesis and respiration, and move the oxygen released by the plant into the space around it. 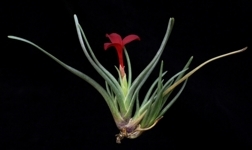 If your tillandsia is in a closed terrarium, open it regularly to facilitate air movement. Stale air will kill any organism. The needs of every plant varies quite dramatically with the space in which it is placed, so it is good to evaluate a plant's care regimen when you get it, and thereafter whenever you change it's space. · How much light does the plant receive? More light usually means more watering will be needed. · How humiid is the space around the plant? More humid, less watering; less humid, morre watering. · What is the temperature of the space? Plants in hot spaces will need more watering than those in cooler spaces. · If the plant is indoors, take note of heaters or airconditioners. Both will dry out the air and change the temperature around your plant. Observe your plant(s) regularly: If they look good, carry on doing what you're doing. If they look a bit off, take note of recent changes to the space, and adjust your care regimen. Like all living things, tillandsias have a life cycle. Tillandsias, like most members of the bromeliad family, will flower once in their lifetime. Depending on whether you bought a young or mature plant, it might happpen soon, or it might take years. (Most plants bought from Treebeard and Co are still young, and will grow larger for a couple of years before flowering.) Read up on your specific tillandsia, and be patient. It will be worth the wait! A few species have insignificant flowers, but most look spectaculer when flowering. Depending on the species the flowers last from a few days to a few months, and can be a variety of bright colours — pink, red, purple, with the odd yellow and even white. 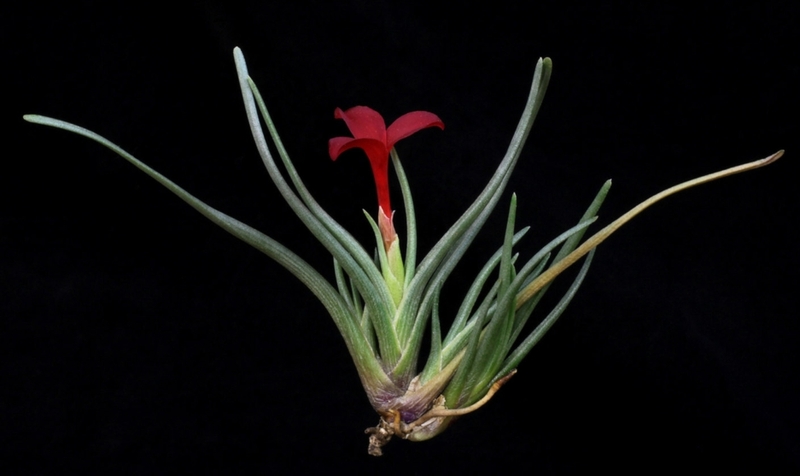 Flowering is the high point of a tillandsia's life, but also the beginning of its decline. Some will hang around for a while, some will die quickly, but before they die they will have one more surprise for you: baby air plants, called "pups". Depending on the species, your plant will reproduce just before, during, or after flowering, by forming 2-8 pups from its base. These start small, but will eventually grow up and flower and create their own pups. You can remove pups from the mother plant when they are about one-third of the mother, but don't be in a hurry — while they're attached to the mother they actually receive nutrients from her. · Bright light, preferably no direct sun. · Indoors with no natural light, provide 12 hours of full spectrum fluorescent light, or use a grow lamp. · Higher humidity, more light. · Greyer leaves, more light; greener leaves can handle less light. · Misting three times a week, soaking every three to four weeks. · Greener leaves, more water; more gray leaves, less water. · Never let the plant stand in water. · Ensure plant can dry properly before nightfall. ·· the leaf tips turn brown or crispy. · Gentle airflow, especially after watering. · In dry air (airconditioning! ), mist more frequently. · If your plant lives indoors, give it some fresh outdoor air every now and then — maybe when soaking and drying.